Nearly one year after we launched our campaign asking ConocoPhillips to reconsider their "destroy all balls" policy towards the historic blue and orange Union 76 Ball gas station signs, the Texas energy giant announced to the Wall Street Journal that they have changed their course. Focus groups held last fall told them what nearly 3000 signers of the Save the 76 Ball petition have already told us: people love the 76 Balls, and don't want them to disappear. The 76 Balls that come off their poles are no longer being smashed or cut into pieces, but being preserved for donation to museums like the American Sign Museum, Petersen Automotive Museum, NASCAR Hall of Fame, Museum of Neon Art and perhaps even the Smithsonian! And a new type of 76 Ball, colored red rather than orange, will soon be installed at up to 100 gas stations in the west. But there are still good reasons for signing our petition. 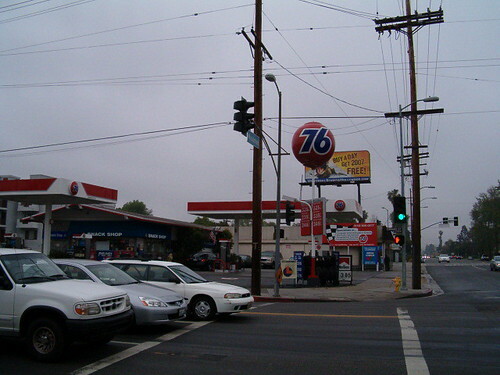 We believe that a select few historically and architecturally significant orange 76 Balls should remain where they have always glowed and spun, like at William Pereira's modernist 76 station in Beverly Hills, one of the spheres along Highway One in Malibu, and the station in Marysville, WA where 76 Ball designer Ray Pedersen buys his gas. Also, ConocoPhillips has declared that no private individuals will be able to get a 76 Ball, which will be a disappointment to our campaign's supporter Michael Madsen. We respectfully ask that ConocoPhillips reconsider this policy, and present one 76 Ball to the individual who conceived, designed and hand-painted the first 76 Ball for the 1962 Seattle World's Fair: Ray Pedersen. And most importantly, we ask that ConocoPhillips commit to pay all costs associated with crating and shipping donated 76 Balls to the selected museums, thus enjoying greater tax benefits and sparing these institutions from having to pay hundreds or thousands of dollars out of their limited budgets in order to receive the gift of the 76 Ball. Our heartfelt thanks to everyone who has supported this campaign through 2006 and into 2007. This is inspiring proof that citizens have the power to reach large corporations and inspire positive change. i find, that if someone from ballard wants something, its best just to give it to them.